Once again, a steel Rolex has sold for over a million dollars. On Tuesday, December 17, Christie’s in New York held its Important Watches auction. 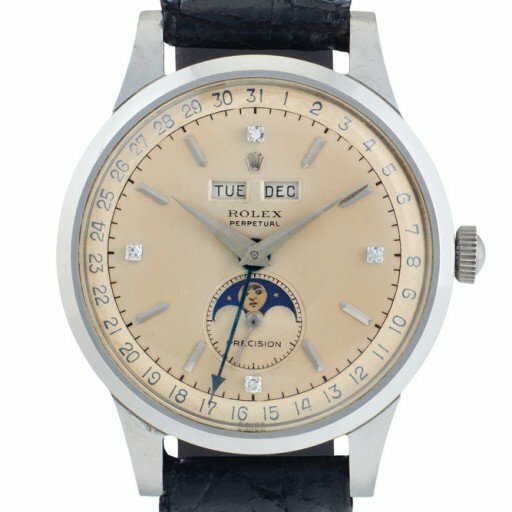 When the dust had settled, Lot 186, a circa 1953 Rolex ref. 8171 stainless steel automatic triple calendar with moon phases, had fetched $1,145,000, shattering its pre-sale estimate of $250,000 – 350,000 with a “fierce bidding war that spanned across four countries.” Needless to say, a new record for the 8171 reference was set. Beautiful in their simplicity, 8171s aren’t all that rare. This one however, has a beautiful cream-colored diamond dial, is in steel, and is in very good condition. It’s been called one of the last grail watches for Rolex collectors. It seems that stainless steel Rolexes are on the move these days, with the best of them beginning to reach the rarefied atmosphere above a $Million. Witness the Lesson One auction last November in Geneva. We’re not sure what’s causing the phenomenon, but if you’re in this game, you may want to strike quick. There’s no telling where the ceiling might be.